I swear that I’ve seen the bearded guy before. 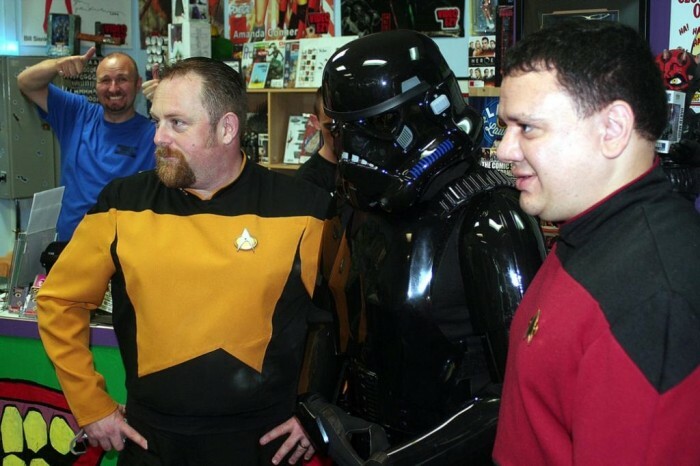 He must go to a lot of cons in Star Trek garb. you must be new to this website. every year we’re..um..treated to a plethora of photos involving this nonsen err.. “cosplay”. Get ready. I’m sure there’s more on the way. IIRC, the guy in the yellow “shirt”, is a MCS member. Maybe it’s even Tiki. Don’t know. Only seen his “birthday” picture. This is in New Zealand, at the Armageddon Expo in Auckland. I worked with both these guys.